Three cyber crimes a week in Andhra Pradesh this year ! 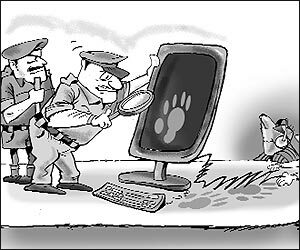 Andhra Pradesh witnessed three cyber crimes a week on average in 2010 and a majority of them were Nigerian frauds, according to the state crime investigation department. Briefing media on the latest case, Additional SP (cyber crimes) U Ramamohan said this was the 54th case this year registered at the Cyber Crime Police Station here, and that the total number of such cases across the state was over 150. He said this was at least 20 per cent more than such cases last year. In the latest case of Nigerian fraud, a resident of Bhimavaram in West Godavari district was lured into paying Rs 15.88 lakh to claim prize money of 700,000 pounds from a non-existent ‘Microsoft lottery.’ He was asked on phone to deposit money in two accounts in ICICI Bank and Axis Bank, towards ‘RBI clearance’, ‘anti-terrorism clearance’, etc and was even given ‘receipts’ for the deposits. “These cyber criminals have email IDs of lakhs of people, to which they keep sending mails in batches. Even a very small percentage of ‘responses’ would mean big bucks for them,” Ramamohan said. Recently, such messages have started coming by SMSes also. Based on prompt information from Vodafone and the banks, Hyderabad CID police caught three foreign nationals in Delhi, Ramamohan said. Two men were from South Africa and Nigeria, and a woman was from Ivory Coast. In most cases of ‘Nigerian fraud’, it was impossible to recover the money because, “they send the money to their home countries the same day through hawala and other channels,” he said. Often, it is difficult to catch the foreign nationals involved because they use gullible local people to share their bank accounts, promising 3 or 4 percent of a “huge money transfer,” Ramamohan said. So far, no cyber criminals were found to be based in Hyderabad. “Most of them are based in Delhi and Mumbai. Recently, some people from Northeast were found to be involved in these crimes,” he said.